CLEVELAND (AP) — Baker Mayfield is making a handoff from the heart. The Browns rookie quarterback has teamed up with Barstool Sports to raise money for Special Olympics, an organization he first made a personal connection with while playing at Oklahoma. Mayfield has helped create a line of clothing merchandise , including T-shirts, hoodies and a flag bearing his image, with 100 percent of the sales proceeds going to Special Olympics Ohio. Mayfield was moved to do more charitable work after being involved in college with “Special Spectators,” a program that allows seriously ill children to have an all-access, VIP-day at sporting events. “It was a special bond, and when you do stuff like that, it makes a huge difference when you can build an actual relationship instead of just saying, ‘Hey, I like this cause I want to throw money at it’,” Mayfield said in a phone interview with The Associated Press. Mayfield said being around children and young adults with disabilities and other challenges gives him perspective — and appreciation. Mayfield launched the initiative during his bye week with the Browns, who selected him with the No. 1 overall pick in this year’s NFL draft. 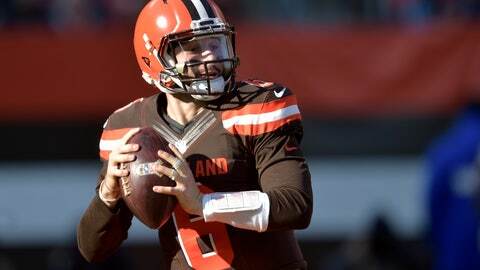 Mayfield had his best game as a pro last week, throwing three touchdown passes as Cleveland beat Atlanta 28-16 to snap a four-game losing streak. It’s been a bumpy first NFL season for both Mayfield and the Browns, who are undergoing more change following coach Hue Jackson’s recent firing. But Mayfield has long-suffering Cleveland fans feeling good about the team’s future, especially because it appears the Browns finally have found a franchise quarterback. For Mayfield, the adversity is nothing new. He battled to win a starting job in high school and then walked on at both Texas Tech and Oklahoma before winning the Heisman Trophy. Obstacles are nothing new, and in some ways, he feels coming to Cleveland and helping the Browns was destined.